1968 was a year of seismic social and political change across the globe. But first, my confession: ‘Je reste un soixante-huitard’. I’m still a ‘1968er’. I feel a continuing allegiance to that period. What follows is my personal reflection, from the perspective of 50 years later when I will soon be a 68er of a different kind (i.e., aged 68). It is appropriate to publish this piece on 6 May, as that was the date of the French uprising where students at the Sorbonne University in Paris took to the streets and clashed with police, making headlines around the world. Later that month, they were joined on the barricades by 10 million striking French workers. An image of the period shows a long-haired, bearded young man hurling a stone in the direction of a police barricade - ‘Sous les paves, la plage’ (Beneath the paving stones, lay the beach). But the image could equally be of the Czech students and workers who resisted Soviet tanks or young Chinese rising up against Communist Party bureaucrats and reactionaries and rejecting Confucian notions of obedience. All were inspirational. And that kind of thing seemed to be happening everywhere: from London to New York, Warsaw to Japan and Mexico. Melbourne too. In 4 July that year I attended a protest outside the US Consulate. I was in my school uniform. Rocks were hurled and it was the first time I saw police remove their identity badges. If there is a single slogan to capture the spirit of that time it is: ‘It is right to rebel!’. Mao said that – but so did John Locke 280 years earlier. 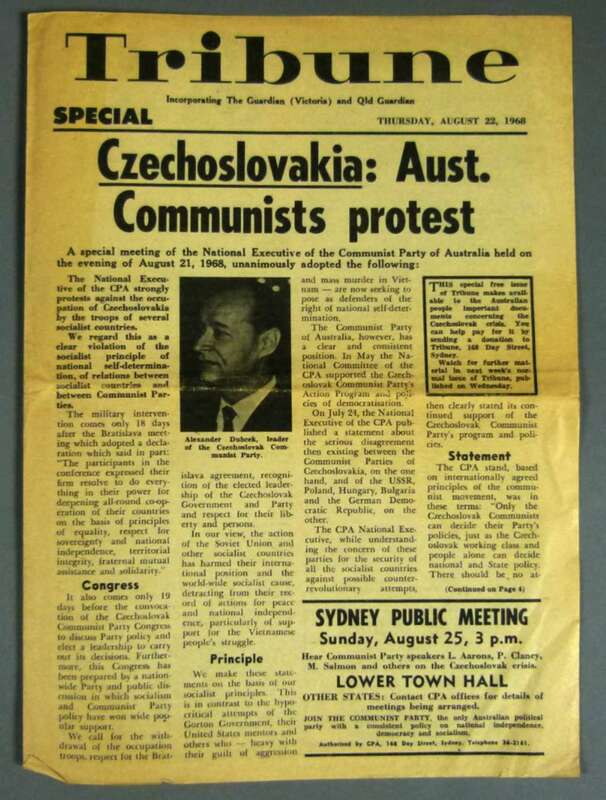 Front page of the communist newspaper Tribune from 22 August 1968, discussing student uprisings in Czechoslovakia. Museum of Australian Democracy Collection. The spirit of the times did not drop from the sky. It rose from material changes and political and social developments. There was so much that was new and exciting: from rock music to television, the contraceptive pill and preparations to fly to the moon and the beginnings of women’s liberation. The ‘explosion’ in university admissions after the Second World War meant that thousands of young people who would never have set foot on a campus in a previous time were now congregating in lecture theatres, libraries and uni cafes in large numbers. I was amongst them. We argued, debated, heckled and offended. And, a combination of radical ideas and numbers, formed a critical mass of protest. What ignited the fuse? Key issues included the war in Vietnam, conscription, apartheid in South Africa, fear of nuclear war, opposition to racism, Third World poverty, censorship, state repression, and hypocrisy. What we didn’t personally experience, we saw on television in our lounge rooms. The images of police dogs being let loose on African American protestors in Alabama will never leave me. While no previous generation had been so well off, we nonetheless felt alienated, and sought to develop our fuller humanity through ‘taking part in the practice of changing reality’ (Mao Tse Tung). In Australia, several publications had been banned by the government. Among them was a pamphlet called ‘American Atrocities in Vietnam’. I decided to distribute copies at my high school. I was very nervous and gave them out surreptitiously. To my relief, nothing happened – other than a mention by the principal at school assembly that unauthorised material could not be given out on school grounds. Such was the spirit of the time that, soon after, I conspired with a few other schoolmates to show our solidarity with the African American Olympians who had raised their fists in defiance at the 1968 Mexico Games. As the morning assembly rose for the playing of the national anthem, three of us stood, raised our left arms, bowed our heads and clenched our fists. There was much idealism and youthful exuberance, along with hard-core New Left and communist politics. In 1968, many of us celebrated our human agency; very few of us saw ourselves as victims. In our imagination, we were optimistic. There is much more that could be said about 1968, including recognition of the negative features of the period and the reasons for its short life. I am glad I was both old and young enough to be an active part of that rebellious year. I hope I’ll live long enough to see its spirit revived. The 1968 protests took place at a time of great social upheaval. 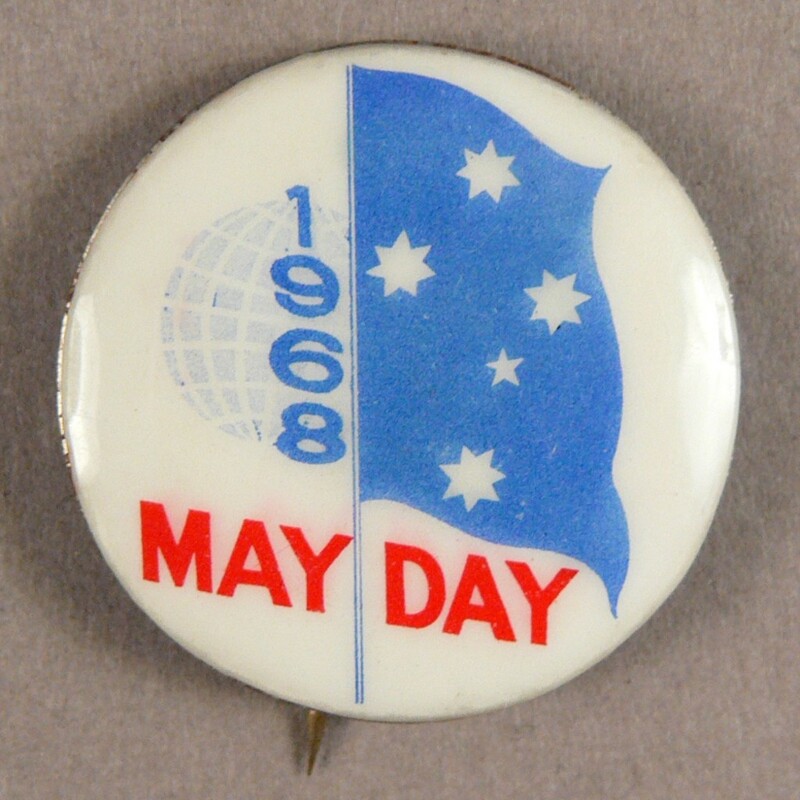 This badge from our collection commemorates May Day, one of the more important dates on the calendar for left-wing protesters like Barry York. Museum of Australian Democracy Collection.